Hey guys! So I am finally getting round to showing you Blake's bedroom he is nearly 19 months after all. I've been wanting to do this post for awhile now but I was never happy with what Blake's room looks like,until now that is. The room itself is a good size and walls were already painted blue when we moved in before we even knew we were having a boy. When it came to Blake's room I knew from day one that I wanted a room that would grow with him. To be honest there isn't really a set theme but I like it like that and its easy to change up when and if it needs to be. We've enjoyed sorting out Blake's room although its taken awhile for me to show you all. Blake's cot is from Mothercare and is the white Padstow cot bed which we got along with a mattress as a gift from my mother in law and step father in law. We chose a cot bed as its suitable for ages up to four years so we wont need to buy a toddler bed. I like that there is room under the cot to store things we currently have his tuff tray, scuttle bug and a few other toys safely underneath. Both Blake's wardrobe pictured below and his chest of drawers (with the car garage on top) are from Ikea. 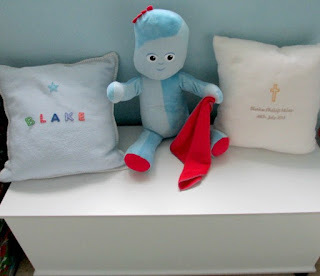 I store Blake's memory box, a teddy and some other toys and bits and bobs on top out of the way and inside his wardrobe I have his clothes organised on hangers and shelves. 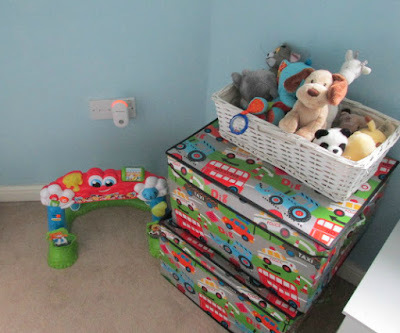 In the corner next to his wardrobe he has his Football goal toy which my sister got him for Christmas and some storage boxes which I got from Amazon (I'll try and link everything I can below) The boxes are a great size and I love the wicker basket that holds all his cuddly toys in. from my sister before Blake was born. Then we have the window which have a few bits and bobs on which were all gifts from family for either Christmas or from his christening day. Underneath the window we have Blake's toy box which on top I keep his large Iggle Piggle toy which Stuart picked up for Blake and two personalised cushions. 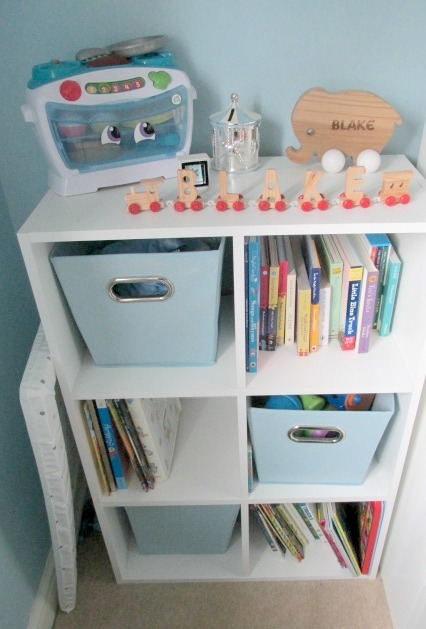 We also store a blue storage box on there with all Blake's toy cars are kept. Then we have a book/toy shelf where I've put a couple of toys and bits on top. 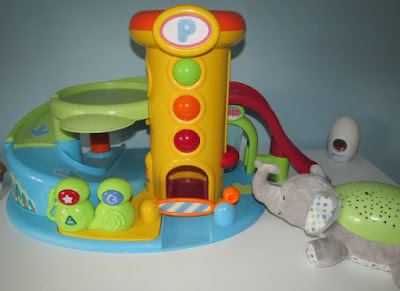 He's got x3 pale blue boxes which store things like his happyland or in the night garden figures in, miscellaneous toys and one which holds puzzles in. The rest of the shelves are for books. 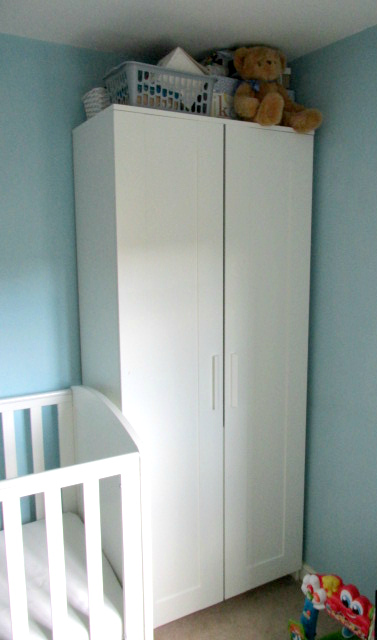 Then we have his chest of drawers which I was on about early from Ikea they are the Malm ones and on top of that we have his ELC car garage, his elephant slumber buddy and his Gro egg. 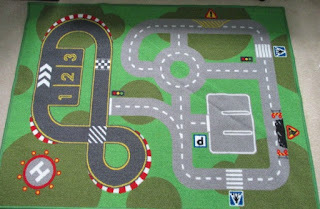 We then have this car rug from Ikea which Blake loves playing with his car garage on. We also have another frame on his wall which is a foot print with his name, DOB, birth weight, etc but I forgot to take photo of that as my camera battery died. So there you go, you've finally had a chance to see what Blake's room is like. I hope you have enjoyed this post I'd love to know what your favorite item/s are so comment below. I love how fresh and clean everything is. We are just starting to decorate our babies nursery. What a lovely, light room - adore all the little details you've included. It's fab Michaela u should get it! I love white in the bedrooms looks so clean looking. I do love the size and shape of the room. I hope we can find something similar when we move one day. The bedroom looks great. I love the colour scheme there. IKEA does the best storage, love the wardrobe and shelves! 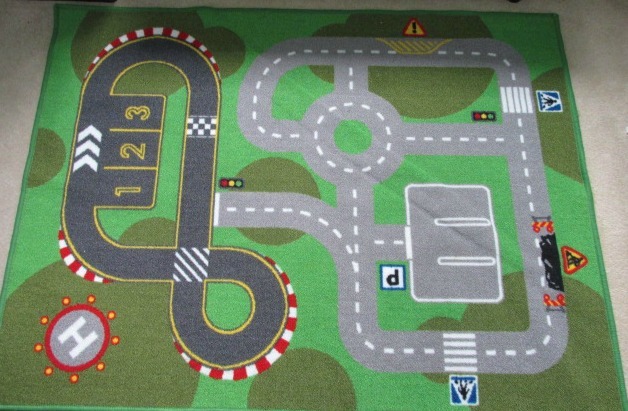 I remember loving my car rug! What a cute room! What a lovely space for him! Something tells me it doesn't stay this tidy for long haha! Definitely not its a mess now lol I took photos after a tidy up session. Love this room. So cute. My son has the iggy pickle toy. I love looking into other peoples decor ideas! This room is so cute, I love the alphabet print. I also love, that as you said 'it will grow with him' It's not too babyish, but the furniture and decor can easily change as your little one grows. What a lovely room. I remember my boy's having a car rug. Love your colour scheme. This is so cute. I love the way you've organized the room. It's perfect! A gorgeous room, what a lucky boy. My son's room is never that tidy! What a cute little room, very traditional! Such a gorgeous and light room. Having a room that grows with him is a great idea. It looks very grown up and love the blue colour you've used. That is a cute room, I love the alphabet canvas the best.